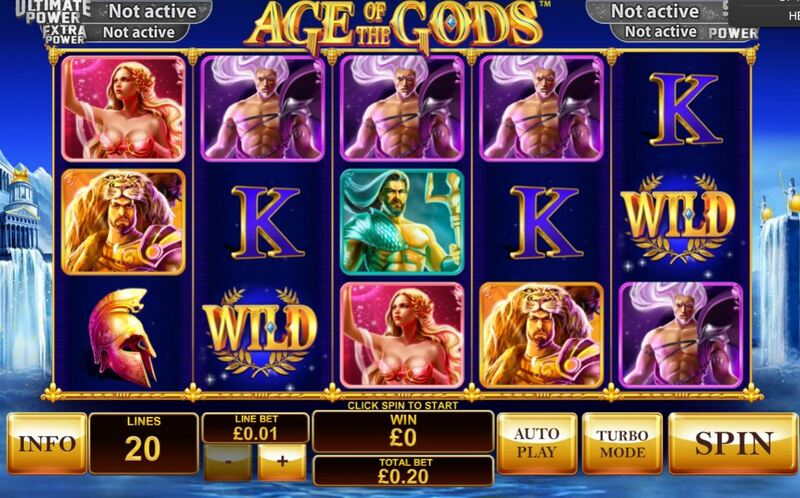 Age of The Gods slot is the title game of a whole Age of The Gods (AOTG) series that game developer Playtech have created to replace the old Marvel games like Iron Man 2 and Fantastic Four. In this instance we get a new game centred around four Gods from Greek mythology as with AOTG Furious 4 slot, with the reels set against a backdrop of an ancient mountain city and dramatic music to accompany us on our quest. The Ultimate Power progressives are linked into this game so the players of the Marvel games of old will still have the chance to hit that elusive mega-win too. So can you reap the rewards of these mighty figures, or will winning prove to be a Herculean task? The impressive graphics offer us 20 paying lines over 5 reels and you would like to see all 5 Wilds on one of those lines as a heavenly 500x bet is your prize. Hestia (red icon) is the best standard icon at 50x bet for a full line, and then Poseidon and Zeus 25x, Hercules 20x ending with Athena and Ares paying 15x for the full 5. The lower pays are the Golden Helmet at 12.5x and the card values paying 7.5x. The Gods also have a special treat for you - if Hestia, Zeus, Poseidon, Hercules and Athena all land on a paying line in any order you get a special 200x bet 'Pantheon of Power' award, similar to Netent's Wild Water with that game's 5 characters! Their best rewards are kept back for a rather interesting bonus game though. Athena - 9 free games with a random multiplier of 2-5x shown before each spin begins. Zeus - 9 free games with the first three played at 1x, the second three at 2x and the final three at 3x multiplier. Poseidon - 9 free games where lightning fires on any random spin from Poseidon's trident to turn up to 5 positions Wild. 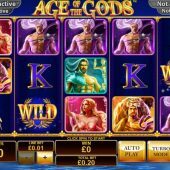 Hercules - 9 free games and he appears as a Wild reel 3 for all spins. You go back to the grid to carry on picking Gold Coins after your games finish, and this may result in a second or even third type of free games all in one trigger if you don't discover Hades first!